Our daughter, Melissa Leigh reached a milestone this year – she graduated from Wayzata High School on June 5, 2007. This is a remarkable feat for a kid whose ammonia was near 2,000 when she was in a coma at 4 days of age! It is a miracle when we think of the many times we rushed her to the hospital to combat metabolic decompensation brought on by something as simple as a common cold. Time flies by… the last update published on Melissa was when she was 11 years old, entering the 5th grade. In this update we will try to cover the last seven busy years! Until the 5th grade, Melissa was fed through her NG tube during the night while sleeping. Her desire to spend the night at friends’ got us to gradually wean her off night feeds to a daytime schedule. She now receives four bolus of her special formula each day. Her formula still consists of Propimix-2, Prophree, 2% milk, water, 2 tubs of yogurt (18 grams of protein) and 1 jar of fruit baby food…mixed with water to make 1800 cc of formula each day. Melissa has been administering her own NG tube since was little and continues to do this four times per day. She has had no medical issues using her NG tube, so we leave well enough alone. When she was 16 we started using the new Vitaflo Express PA/MMA product. She did not want to do her bolus at school any longer because she was missing social time with her friends while she was in the nurse’s office to doing her bolus feeds. Now she drinks the Vitaflo PA/MMA formula during lunch and uses the Tropical Punch flavoring. She likes that her friends participate in preparing her lunch when they ‘shake up’ the cup for her. For those who aren’t familiar with Vitaflo, it comes in small packages and is an amino-restricted formula with about 18 grams of protein, but little calories. Melissa still requires high calories in her daily diet, so supplements the Vitaflo with three bolus of her formula. During the past 2-3 years Melissa has also had an enormous increase in her oral intake of solid foods. She is eating popcorn shrimp (not on a daily basis), mashed potatoes, pizza, hot dogs. We are delighted that she’s trying all sorts of new things. She took several cooking classes in school, which was a good motivator – in addition to her teachers asking her to taste new foods. Since her food intake is minimal, we do not routinely monitor the protein intake of these items. There was one instance where she ate two hotdogs, and threw up shortly after that… so I had to remind her that she should limit herself to one hot dog! Melissa still takes 45cc of Carnitine (Carnitor® by Sigma Tau, not the generic form) each day. We mix 15cc in three of her daily bolus. This is a high dosage which causes her to deal with persistent body odor caused by the Carnitor. But we have decided to accept the challenge because two years ago she was diagnosed with Cardiomyopathy. She was put on Cozzar to lower her blood pressure and we increased her Carnitine in an effort to help build more strength into her heart muscle. Her annual heart re-check showed marked improvement, so we are sticking with this treatment plan. In my last article I mentioned about the problem Melissa has had with her teeth. We switched to another dentist and decided to have her teeth cleaned monthly, because of the high level of plaque she develops. We then decided it was time to try braces on Melissa. When she was 15 we went to an oral surgeon and had two upper teeth removed in preparation for braces. It was a scary ordeal, since the surgery done was in the oral surgeon’s office. She did great and started wearing the braces. She had difficulty keeping them cleaned and her orthodontist felt that they should come off after only wearing them one year. Her teeth straighten considerably. While they are not 'perfect', the look great (as you can see from her picture above). Melissa has now 'become a woman' with the onset of her menstrual cycle. Melissa has been able to successfully handle the related hygiene tasks and has not had any associated health issues. A related area that we have yet to address is birth control. We know it is something we will have to face in the future – but, I rather not think about that right now! And speaking of decisions, when Melissa turned 18 last November, we went to court and were granted Guardianship for her. This is important because she is now an adult and without this legal authority, we faced the risk of not being able to direct her continuing medical care (among other things). Now we make decisions about her life and care together as a team. Melissa has also started receiving Social Security SSI Supplemental Income payments. This is important because she can now contribute financially to her own support. As you can see from looking at her graduation picture, she has earned her ‘letter’ from the high school athletic department. We are quite fortunate because Minnesota is the only State that has an ‘adapted athletics’ sports program. This program is divided into two leagues – PI (physically impaired) and CI (cognitively impaired - for students with an IQ below 70.) Melissa qualified for either, and chose to participate in the more athletically challenging CI program. 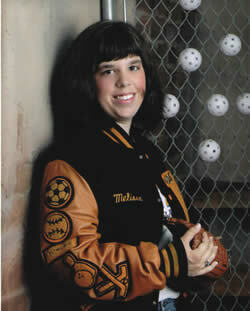 Melissa played soccer, floor hockey, softball and bowling. She was the captain of her team in each sport. She was the starting pitcher on the softball team and had many strike-outs to her credit. And she was part of the bowling team that won the State Championship her Junior year. Through her participation in these varsity sports, Melissa learned valuable skills in good sportsmanship and teamwork. She also became widely recognized by other kids in her school, which has over 3,000 students! In addition to her high school sports, Melissa has been a regular participant in Special Olympics since she was 8 years old. She participates in gymnastics, golf, basketball and bowling… and has earned numerous medals that reflect her dedication and hard work! As I am sure you can tell we are very proud of the achievements that Melissa has gained over these years. She is a leader and role model among her peers. She has overcome the many obstacles put before her as a result of her Propionic Acidemia and has become a great young woman. A woman that we admire and love very much. I would like to acknowledge and thank her metabolic physician, Dr. Susan Berry and dietician, Dorthey Markowitz at the University of Minnesota. Dorthey has been Melissa's dietician for the past 18 years! We really could not got Melissa to this point without the two of you and we appreciate everything you have done for Melissa (and us)! Well, the last time I formally wrote about Melissa was in the April 1995 issue of the newsletter. I thought since I needed to fill some space in this newsletter, I would give you all an update on what’s happening with our daughter, Melissa. Melissa turned eleven years old last November and is currently mainstreamed in a 5th grade classroom in public school here in a suburb of Minneapolis, Minnesota. She is truly a Minnesota kid and loves winter and playing in the snow. Since she has been healthy, and not metabolically unstable for almost "five" (knock on wood) years, I don’t tend to cringe when she does go out and play in the cold and snow. She continues to get all of her nutrition from her "NG" tube. (NG stands for nasal gastric) Yes, we have continued the use of an NG versus a G-tube, mainly because, well, we just haven’t had any problems. She has been putting down her own NG since she was about four years old…and just recently we moved up to a bigger NG tube (10 French), in order to make her bolus feeding go a little faster, and not so difficult to push with the syringe. Since going to this bigger NG, she has been able to perform the bolus herself! I have to admit, even though I do supervise her, it is a great relief on me and my arm muscles! She is very proud of herself, and I am even "training" her to measure her own formula. Her formula consists of Propimex-2, 80056, whole milk, water, one jar each of Gerber’s fruit and meat baby food. I believe adding the "real" foods has contributed to her good health. Melissa does not really see herself as different, and is a very happy-go-lucky child. She is developmentally delayed and has attended private speech therapy for the past seven years. Her speech has moved up to about a 6-year-old level, and reading is on a 3rd grade level, and math is about a 2nd grade level. She does have private tutoring, and even though she is labeled at school as "Mild-to-Moderate Mentally Impaired," she does function much higher than similar children with this label. She does have good memory skills and is always eager to learn. She is currently in a Special Olympics Gymnastics team, and last summer proudly won four metals at the state meet. She is also taking swimming lessons, and is on an adapted t-ball team in the summer. 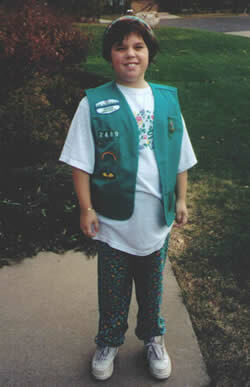 She has been involved with Girl Scouts the past few years, but of course, I’m one of her leaders and I’m always advocating for her to be included in typical activities. Her social skills are obviously delayed as well, but after children get to know her, they do enjoy playing with her. She is definitely a "daddy’s girl" and enjoys helping her dad work on his car, or go for a motorcycle ride. She started a new school in our new neighborhood this past fall. I had her dietician, Dorothy Markowitz, come and speak during "Disabilities" week and she did an awesome job explaining "diets" and Melissa’s disorder. I think that the kids now have a better appreciation for her. She recently went through some oral surgery, and while we were anxious about her going under anesthesia, she again amazed us by going through this procedure with flying colors. The dentist removed eight of her baby teeth and polished and cleaned her teeth. I had heard of other PA’s that have teeth problems, mainly due to the lack of protein. Her enamel on her teeth is not very strong and her gums had overgrown onto her baby teeth, thus not allowing them to loosen and come out. Thankfully, I found a great dentist who specializes in special needs that has managed to keep her teeth in order. Teeth can be such a "social stigma" to other kids when they don’t look good. Another problem with "fitting-in" to school has been an "odor" that she has sometimes, especially when she sweats. I believe it’s the Carnitor®, and her metabolic doctor, Sue Berry, is going to look into this, since she has heard of other PA’s with this odor problem. If you have any solutions to this, please let me know! I enjoy sharing my story with all of you, and also producing the OAA newsletter. Knowing that other families can learn from our experiences is so rewarding! Please feel free to call, write, or email us if you have any questions!